In Other Words – Clause-28 Window Display 1988, a photo by Pride in Our Past on Flickr. 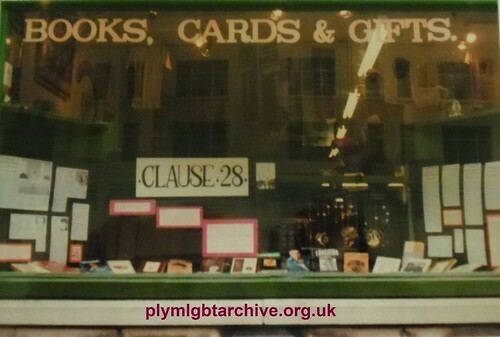 In Other Words Window Display 1988 raising awareness of ‘Clause 28‘ or Section 28 of the Local Government Act 1988 that caused the controversial addition of Section 2A to the Local Government Act 1986 (affecting England, Wales and Scotland), enacted on 24 May 1988. 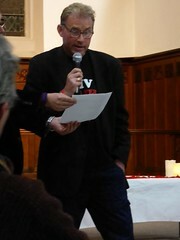 The amendment stated that a local authority “shall not intentionally promote homosexuality or publish material with the intention of promoting homosexuality” or “promote the teaching in any maintained school of the acceptability of homosexuality as a pretended family relationship”. 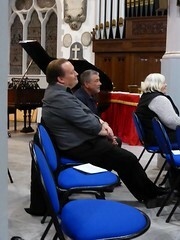 “We have always wanted to provide a service for gay people in Plymouth, and support local campaigns and groups. We always like to do up-front window displays for Pride in June and National AIDS day on December 1st”. This is an example of one of those window displays.